If you’re like me, you’d happily brush and groom your dog every day if you had time. The problem is the rest of the family are a distraction and we all get busy. This means your dog will occasionally get matted fur. Depending on the breed it is inevitable. 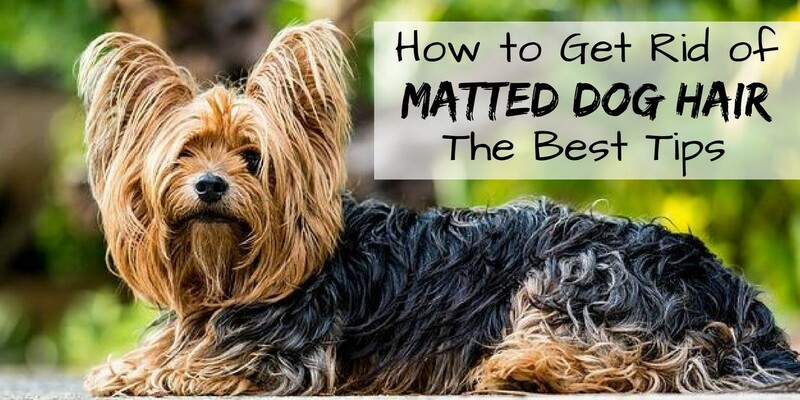 All dog owners need to know how to get rid of matted dog hair. Here are the tips to get rid of matted dog hair. Mats show up as dense, tangled patches of fur. They often occur if you dog has been rubbing against other surfaces. I love seeing my dog roll around in his back or his side because I know he’s enjoying it. But I also know this means more chance of getting matted dog hair. As you will already know, matted fur is not a life threatening problem. But it can be very uncomfortable for your dog. If you leave the mats for a while, they can become very painful and cause your pet to behave differently because he or she can feel something is wrong. Matted fur can also cause problems with your dog’s skin. The mats don’t allow the dog’s skin to stay moisturized and they can cause dry skin problems. This is the most calming brush for your dog for regular weekly brushing. Click Here to see the current price. The easiest way to avoid matted dog hair from forming is to regularly groom and brush your dog. As I mentioned, we all have good intentions but sometimes time may pass and we forget how long it has been between brushing. Try to brush your dog’s fur at least once a week. If it’s long curly fur, try to do it every couple days. A soft dog brush is ideal and your dog will love the attention. I love seeing how calm my dog is when I’m brushing him. Sometimes I make the whole brushing process easier with a small amount of water sprayed on the fur before I brush. If your dog does get a lot of matting quite frequently, you may want to consider keeping you dog’s fur trimmed down to help prevent the mats from forming. Click Here to see the current price on this self-cleaning slicker brush for dogs. Other than using a soft brush regularly, you can also use a slicker brush to help prevent and remove fur mats. I recommend getting a self-cleaning slicker brush for dogs because they are so convenient. Most dogs tolerate a slicker brush quite well. But some dogs don’t like them. Most dogs prefer the ZoomGroom type of soft brush which is very calming for them. If you’ve never used a slicker brush before, start very softly with it on your dog. You don’t want to make your dog fearful of it. It is definitely a different feeling on the skin and fur. This spray detangler for dogs works better than most products. It can be used to detangle one mat or used all over. It is a leave-in detangler and leaves your dog’s fur soft. If you haven’t managed to prevent the matted dog hair from forming, the next step is to untangle the mats that are there. You should try to gently pull the mat apart. The aim is to separate the mat into smaller mats. If the fur mat is not severe this should be easy to do. If you feel like there is no chance of separating the mat without something extra to help, try using a detangler to help you gently ease the fur to break it down into smaller sections. Once you’ve separated the matted dog hair a bit, take a wire brush or comb and slowly brush through the fur where the smaller matted sections are. It will take patience but if your dog is enjoying the attention you’ll just need to work your way through the tangled fur. Should I use detangler on the matted dog hair? Yes. Detangler is a wonderful product. You can use a product made specifically for the job of detangling. Alternatively, you can try a natural remedy like olive oil as a detangler. I tend to use a store bought detangler. I like the convenience. The detangler is ready to go in the bottle. And I’ve had more success with bought detangler. But if you don’t have any, use some olive oil because you already have it in your home. After you’ve had success with the wire brush, use a softer brush through all the fur in that area. You can use a bit more detangler as conditioner on your dog as you brush. But don’t overdo it when you spray on the detangler. You don’t need a lot. This de-matting comb is amazing at removing fur mats. It has slightly serrated blade edges to cut through the matted fur. You use it by combing in the direction of the hair with a normal combing motion. If you haven’t been able to detangle the fur using a spray on detangler then you’ll have more success with this detangling comb for dogs. For dogs with medium to long haired coats, you’ll love this comb. It is an essential dog grooming tool to keep on hand. It is a cheap product but it makes sure you get the results when you need them. If you’ve experienced frustration in the past at how long it takes to remove fur mats, then you’ll want one of these de-matting combs. This de-matting comb is made for right-handers but it comes with instructions to change the direction for left-handers. You simply need to remove the nut on the top and change the blades to the opposite direction and replace the nut. This means you can keep the sharp side of the blades away from your dog’s skin whether you’re using it right or left handed. What if there is No Chance of Me Removing the Mat? If your dog’s fur is severely matted and you can’t separate the matted dog hair you need to take a different approach. You’ll know when it’s too severe because you won’t make any progress with it and your dog is likely to wince in pain. When this happens the matter fur needs to be removed entirely. This is best done at a vet clinic or pet grooming professional. There are clippers designed specifically for dogs and matted fur. While at the clinic or stylist, ask them for tips on grooming techniques for your specific breed. They might have good advice for avoiding the mats in the future. It is very important that you get rid of the fur if you can’t remove the mat yourself, because underneath those mats, there might be bugs, parasites, or skin injuries. Ticks are a serious threat to dogs. I would never want to put my dog at risk, so please remove the matted dog hair. Even if it leaves your dog’s fur a bit uneven for a while, it’s important for your dog’s health and wellbeing. We don’t always know when our dog is going to get a bad patch of matted dog hair. If you have to go to the store and buy detangler and a wire brush to deal with the problem it can be quite off-putting. Everyone is busy and we often procrastinate, especially when the problem is not life-threatening. Be prepared. Make sure you have the necessary items at home so you can deal with fur mats when they arise. Every day longer you leave it, means another day of discomfort for you beloved dog. And if you need to rush off to work or out to a school commitment, your dog’s comfort and well-being is being delayed simply because you didn’t have the right tools at hand. Add a few extra items to your dog grooming kit. They don’t cost much. You’ll appreciate the forethought when you really need them. And your dog will appreciate it too. ☑ Need to learn how to clip a dog’s toenails? Click Here to read the details.